To ensure the continued safety of the residents, there are a number of electrical certificates which a building may require. 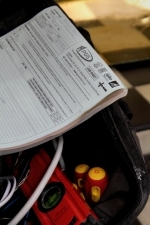 PGS can advise as to which type of report you require and help ensure that your inspections are carried out by an electrician with suitable accreditations and qualifications. The electrician will make sure that your electrical works are safe, and compliant with Building Regulations. Contact PGS for more information about inspections and reports. Below we describe details of some available reports. Electrical certificates can be issued by members of different accreditation bodies including NICEIC, NAPIT and ELECSA. This can be confusing so we always suggest you get in touch with your electrical contractor to ensure that the correct inspection can be arranged. Whenever something electrical is installed in a house or flat, a domestic installation certificate is required in accordance with Building Regulations. This is to prove it is safe and to reduce hazards or injury caused by faulty electrics. If you are selling your property your surveyor may ask you for evidence of these installation certificates. A minor works certificate is an electrician accepting responsibility for work they have done. It is required for smaller installations or alterations to a domestic building; any section of rewiring, installation of electrical appliances or changes to lighting etc will need to have a minor works certificate filled out to state they are safe and have been correctly carried out. A PAT test is designed to lower the risk caused by electrical appliances, by checking they are all in safe working order. Faulty electrical appliances can fuse entire buildings, cause fires or electrocute the user. Any employer has a legal obligation to regularly maintain and check company equipment that people may use. This is an electrical survey, which can tell you the general condition of your electrics, and flag up any problems or issues. For instance, a PIR/EICR can reveal when circuits are overloaded, any problems with installation or wiring, show a lack of earthing or bonding, or even note when a DIY solution isn’t complying with safety standards. The quality of electrical installs will always lessen over time, which is why it is recommended that these PIR’s take place at regular intervals. For an owner occupied home, this is once every ten years, or when a person is selling their property. However, these intervals come around more frequently for letting agents and landlords. The recommended time left between PIRs on a rented property is every 5 years, or at the change of occupancy. Whenever the house is being leased to a new person, a new report needs to be carried out to ensure the previous occupants didn’t damage the electrics in any way. Although these reports are not compulsory, If something goes wrong with the electrics in your tenanted house, you may be liable if you cannot prove you have had them tested. These reports could also contribute to lower insurance premiums.